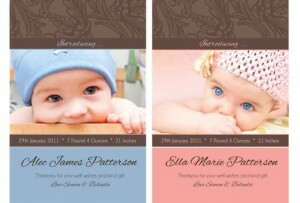 Now, giving out baby announcement cards or birth cards tend to be a trend for parents all over the world. It’s really a great approach to tell your family that you already had a baby. But just as giving christening invitation cards, Christmas cards or even wedding invitations, there’s a few points that you ought to constantly bear in mind. In this article, you will learn the necessary things concerning birth announcement cards that every parent and parent-to-be should know. 1. What information needs to be featured? The information on the card should be able to answer typical things a person will ask the parents. The child’s name, weight, length, date and time of birth, and the parents’ name would be the ones commonly included in the announcement card. Although sometimes, they even include the name of the baby’s sisters and brothers, grandparents, and who delivered the baby. In the event the parents adopted the child, the adoption date and the child’s place of birth in most cases are included. On the other hand, in case you don’t feel completely at ease disclosing a lot of information, you can always control all that goes in the card. 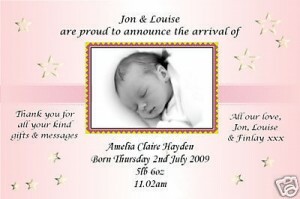 It is not the same as baby christening invitation cards that needs certain information. 2. To whom would it be sent to? It is determined by the parents. Some give it only to friends and family, but some send it to a bigger group. Still, ideally, these invitations are just given to those who the parents think will be hurt in case they do not get one. There is not any specific rule on who should get the announcement card. If you’re fairly worried with the price, there is no need to be. You need not look into the entire holiday card list when giving one. 3. When will it be sent? As opposed to other types of invitations such as the baby christening invitation cards that has to be delivered on a family member or a friend’s mail a few weeks or months before the actual occasion, delivering a baby announcement card would depend on the arrangement of the parents. Since it is going to be a totally busy time for them, giving it a bit late is certainly acceptable. But, if the parents choose to plan everything beforehand, they could pick and design the pattern on the Internet, insert their preferred name of the child, and save it. It’ll be also beneficial to do this because they wouldn’t have to cram after the child is born and only quite a few things would be added later on. Cards and invitations have been fundamental part of the tradition, whether it’s a christening invitation card, thank you card from a wedding, or a Christmas card. And why not? It isn’t just one nice reminder, it also is a very good memory preserver. That is the reason why baby announcement cards are now becoming very popular. It isn’t simply to let people know that the parents have had their child, it’s also an expression of how pleased they are of welcoming a person in the world and also in their lives.